This mashed potato casserole is a delicious combination of hot mashed potatoes, sour cream, cheddar cheese, and green onions. 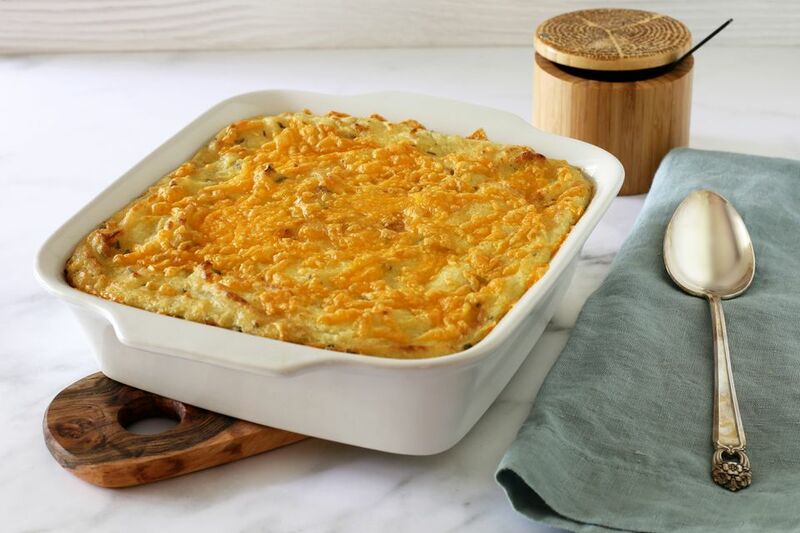 The baked casserole takes everyday mashed potatoes to new levels. Feel free to change the ingredients up a bit to suit your family's tastes. Add some finely chopped ham or crumbled cooked bacon for a loaded potato casserole. If you like a more subtle onion flavor, replace the green onions with a few tablespoons of fresh chopped chives. A tablespoon or two of fresh chopped parsley is another excellent option. Or, If you like a crisp topping, sprinkle about 1/2 to 1 cup of buttered breadcrumbs over the potato casserole just before you put it in the oven. French fried onions would make a tasty topping as well. This potato casserole is an excellent choice for a holiday meal, Sunday dinner, or any special family meal. Or take the dish along to a potluck dinner. Heat the oven to 400 F. Lightly butter a 2-quart baking dish or spray it with nonstick cooking spray. Peel the potatoes and cut them into chunks. Place the potatoes in a large saucepan or stockpot; cover them with water and add 2 teaspoons of kosher salt. Place the pan over high heat and bring the potatoes to a boil. Cover the pan, reduce the heat to medium-low, and boil the potatoes for about 20 minutes, or until they are very tender. Drain thoroughly. Mash the potatoes with 6 tablespoons of the butter, sour cream, milk, green onions, and about 3/4 cup of the cheddar cheese. Thin with more milk or cream, as needed. Taste and add salt and pepper, as needed. Spoon the potato mixture into the prepared baking dish. Drizzle the remaining 2 tablespoons of melted butter over the potatoes. Bake in the preheated oven for 25 minutes, or until the casserole is lightly browned. Scatter the remaining shredded cheddar cheese over the casserole and return it to the oven for a few more minutes, or just until the cheese has melted. Buttered breadcrumb topping: Add the entire 1 cup of shredded cheese to the mashed potatoes. Instead of drizzling the 2 tablespoons of melted butter over the potatoes, toss them with about 1/2 to 1 cup of soft breadcrumbs. Sprinkle the buttered breadcrumbs over the potatoes and bake as directed or until the crumbs are golden brown. Moderate to high starch potatoes are the best choice for mashed potatoes. Use russets, Idaho baking potatoes, or Yukon Gold.